Otherwise known as a pretty amazing Korean horror film. I first heard about this film from Rare Horror and was very interested (they’ve turned me onto a couple of interesting films). It took a while, but I finally tracked down and got my hands on a copy of this very strange Korean fantasy/horror film, directed by Yim Pil-sung and starring Chun Jung-myung. I have to say, I’m surprised this one hasn’t been given an American remake yet. It’s definitely the sort of story that makes you think of the success of The Ring or The Grudge. Hansel and Gretel (or in its Romanized form, Heljelgwa geuretel; don’t ask me for the Hangul, I don’t know how to get it on this blog) is about a salesman named Eun-soo who has learned that has gone on a trip to visit his sick mother, which may also be an excuse to get away from his girlfriend, who is four weeks pregnant. On the highway he gets into an accident and wakes up in a forest. He meets a young girl who takes Eun-soo to her home, where he meets her parents and her older brother and younger sister. At first glance, they seem like a 1950’s TV family from Korea. But from the moment he arrives, Eun-soo has senses something very strange about the house and the family here, confirmed when the parents up and leave, asking him to watch over the kids. 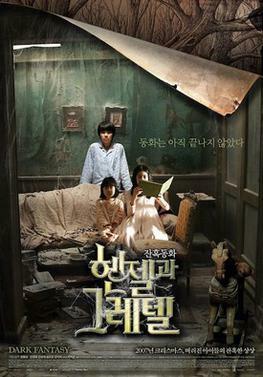 Unable to leave the forest, Eun-soo tries to figure out the mystery of the house and the children and find a way to escape. And when he finally finds out the secret, it’ll change him forever. This is definitely an interesting film. The sets and cinematography are excellent, like looking at a Christmas tableau with a horror hidden within it (which makes sense, considering Christmas is a running theme in this story). And the acting, especially from the child actors, is amazing. I forgot that these were actors, but thought they were their characters. This film is practically gore-less (yay! ), doesn’t have many jump-scares (sad, but whatever), and works hard on building an atmosphere of dread, which works for it (especially if you turn off the lights and watch it in the dark like I did). There are only two things I don’t like about this film. One is that it’s two hours long and may feel like a drag to people who like fast-paced stories with plenty of jumps and scares.The other is that when we finally find out how this whole creepy thing gets started, it seems a little riddled with cliches. But other than that, it’s a pretty creepy film with lots of dark, fantasy-based beauty. There’s plenty of character development and growth, which can be rare in horror films, and in the end you find yourself being very impressed with this journey you’ve gone on with the character. I’m giving Hansel and Gretel a 3.5 out of 5. It’s a very strange movie, a lot of fun, and if you get a chance, check it out. It’s already given me a few ideas for stories, so that’s definitely a good sign. I’ll definitely check out a few more Korean horror films if I can find some. Should be fun and inspiring.